The traditional market of Ubud town is a famous place in Bali that is visited by thousands of tourists every day. They go there to buy souvenirs or handcraft such as wood carvings, woven cloth, brass statue, paintings, and screen-printed t-shirts. Food and drinks are also available in the market. 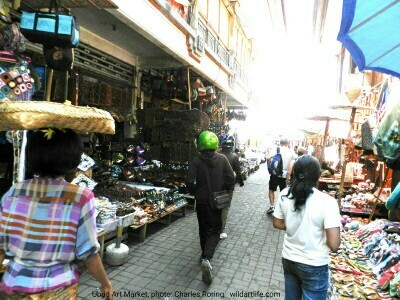 The market is located on Jalan Raya Ubud across from Royal Palace. When buying goods, visitors often have to bargain to get the best price. A buyer should not pressure the vendor to give the lowest market. If the price is too low, the vendor could not make profit to pay the rent of the market space and feed his or her family. For me, when buying handicrafts, we get the fair price. The best time to visit Ubud Market is in the morning. By going there early, we can see a large variety of newly arrived handicrafts and explore all shops when there are still fewer people around. Towards afternoon time, more visitors will come to the market. I always see traffic jam in busy hours between 11.00 and 14.00. If there are groups of tourists that come with big buses, we will see the market becomes very crowded. It is difficult to walk through the narrow alleyway when there are a lot of tourists in the market. Sometimes visitors go to the art market at 17.30 local time just half hour before the market is closed. I heard that it is the best time to get the cheapest price for the handicrafts or paintings that they are interested in buying? Market vendors will be busy making preparations for closing their shops so they will give cheaper price to their customers. Ubud is a famous tourist destination in Bali. It is a place for visitors who are interested in exploring the natural beauty of the landscape and the cultural wealth of Balinese people.